This is my hundredth post. Over the last ninety nine posts, I have learnt a lot of new skills. My cooking has improved and expanded in ways I couldn't have imagined when I sat down to write my first post. I've discovered how much I enjoy photography and developed a style I like. Most of all, it has shown me how much I still have to learn and how many more exciting things lie in the future. I can't explain how excited I am. To celebrate this, I decided to make a cake. This is a recipe I have had my eye on for months, but never quite got around to it. I added a butterfly flourish. I couldn't resist. I also thought it was apt that it therefore contained two of the things I've enjoyed learning about most while keeping my blog: how to make caramel and to create chocolate decorations (as on my Beautiful and Damned Cake and the Present of Profiteroles). Instead of looking forward, this cake looks back to celebrate what has gone before. This cake is about as rich as it gets. The cake is intense and damp, then smothered with the glorious caramel. 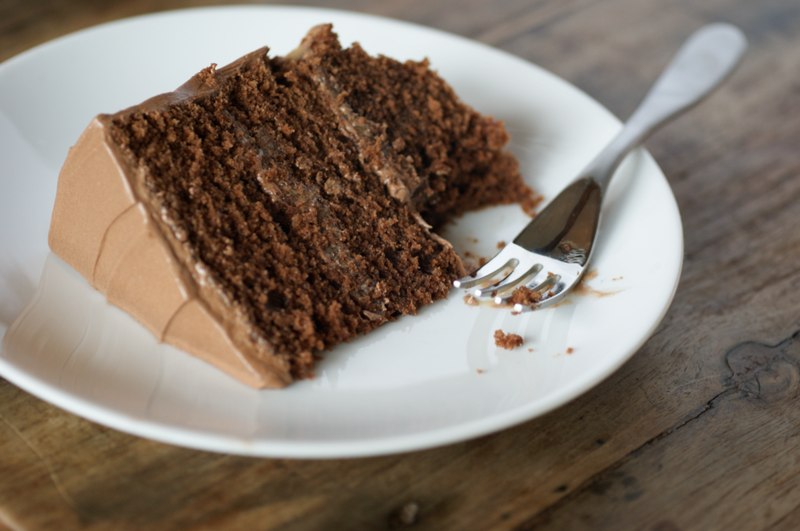 The icing, found between each layer and covering the whole cake, is almost ridiculous in its decadence. You take sugar and water and make caramel. Then you whisk in a lot of double cream. Then you pour it all over a big pile of dark chocolate. Then you beat in a big bowl of butter. Despite all this, it's not as over-the-top rich as you would think - it's smooth and complex. I found the most disappointing aspect of this cake to be the cake itself. The bits I cut off to level things up were delicious and I think it's a very nice plain chocolate cake, but it didn't work perfectly with the rest. This could well be the way I made it, but the flavour just slightly jarred with the icing and caramel. Perhaps it was because I couldn't find vegetable shortening so substituted extra butter. Another time I might use a different recipe - perhaps my ever reliable Birthday Cake with some good quality cocoa. It wasn't in any way bad, just not perfect. Despite halving the recipe, this was a big cake. I only used about half the icing I made - I'm not a fan of inch thick icing in between the layers and all over, even if it does look striking. If you're also like me, maybe reduce the recipe or make a batch of cupcakes or something to smear the spare icing on. I'm not entirely sure why I decided on making a butterfly for the top. Perhaps because it was a challenge to make wispy wings that would stay flying in the air and not sag into the icing or snap. I forgot to sprinkle some fleur de sel onto the top of the cake until after I had photographed it and eaten a slice, hence the fact that only a few photos include it. I like the way it looks like the first flakes of snow falling on bare ground around a fragile butterfly flickering in the cold. Put the sugar, glycerine and water together in a saucepan. Attach a sugar thermometer. Stir to dissolve the sugar as you bring it to the boil over a high heat. Meanwhile, heat the cream and salt in a small saucepan until the salt is dissolved and the cream has reached a boil, then remove and set aside. Keep going with the sugar until you reach about 350F - then try to keep the mixture at about this temperature until it reaches a deep golden brown. At this point, remove from the heat and let sit for a minute before whisking in the hot cream. Let the foam subside, then whisk in the sour cream. Leave to cool then store in a jar in the fridge. Preheat the oven to 160C. Grease and line three 6" tins (I only have one here - I split it three ways and did one after another). In a medium bowl, whisk together the cocoa powder, sour cream and hot water then put it aside to cool. Weigh out the flour, baking powder, bicarbonate of soda and fleur de sel and sift into another bowl. In a mixer, beat the butter for 5 minutes. Add the sugar and beat for another 7 minutes, occasionally scraping down the sides - it should be light and fluffy. Slowly add the beaten egg, mixing well between addition. Add the vanilla and beat again. Start adding alternate small amounts of the flour mixture and the chocolate mixture, starting and ending with the flour. Divide the batter. Bake for about 20 minutes or until the cake is springy to the touch and a toothpick comes out clean. Leave to cool for a few minutes before removing from the tin and leaving to cool on a wire rack. 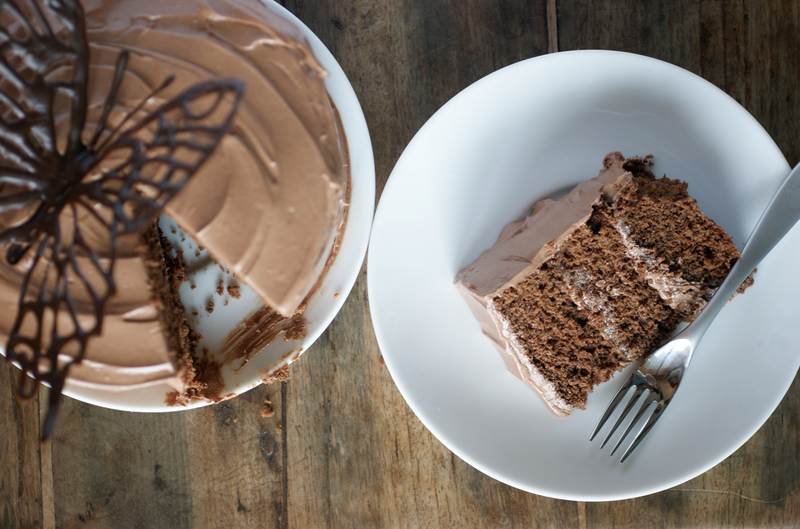 When cool, level out the tops with a serrated knife or cake knife. Before you start have all the ingredients measured out and the mixer standing ready. Make the caramel as you did for the fleur de sel caramel above, except that the cream doesn't have salt in it. Instead of adding the sour cream, let it cool for a few minutes. While it cools, chop the chocolate and put it in the mixer bowl. Pour over the caramel mix. Leave for a few minutes then stir until smooth. Put into the mixer and beat on low until the mixer bowl is cool to the touch and the mixture has cooled down. Tip in the butter and turn the speed up to medium-high. Whip until the mixture is silky smooth, thick and whipped. Take out and put into the fridge until needed. 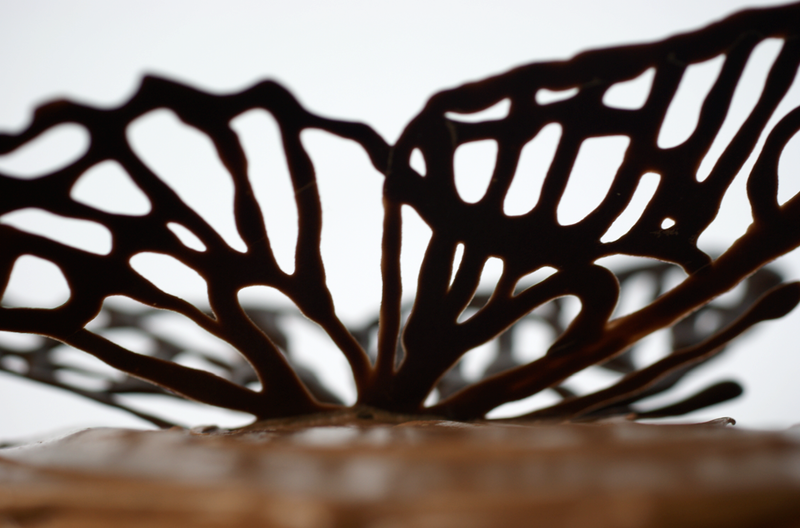 The process is similar to the one for the decoration on the Beautiful and Damned cake. I also creased the parchment paper along the joins between the body and wings so they folded easily and lightly greased the paper so it released. I made a foil mould of how I wanted the butterfly to sit before I piped it and then let it set in that position. Place four strips of parchment paper over the plate you want to use. Put the first layer of cake on top of them. Spread with some of the caramel and then some icing. Add another cake layer, the caramel and icing and then the final cake layer. You can use a dowel to secure the layers at this point if you like (I used a wooden kebab stick, cut to size). Make sure they layers are straight and then add a crumb coat. Put in the fridge to firm for half an hour or so. I made the butterfly in the gap. Take out of the fridge and ice with the remaining icing. 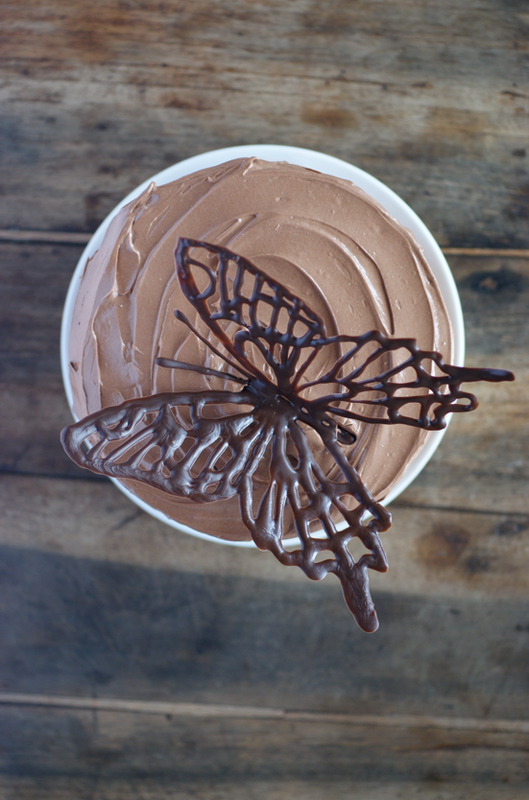 Position the butterfly, sprinkle with fleur de sel and put into the fridge to set for half an hour or so before serving. This is stunning! Congrats on your 100th. I'm nearing mine as well. Look forward to the next 100 and more :). Congratulations!!! I just love all your chocolate decorations! The cake sounds delicious! I hope I can also celebrate my 100th post... still a long way to go, though! But just like you, I'm learning so much and enjoying every step of it!!! Congratulations on your 100th post! 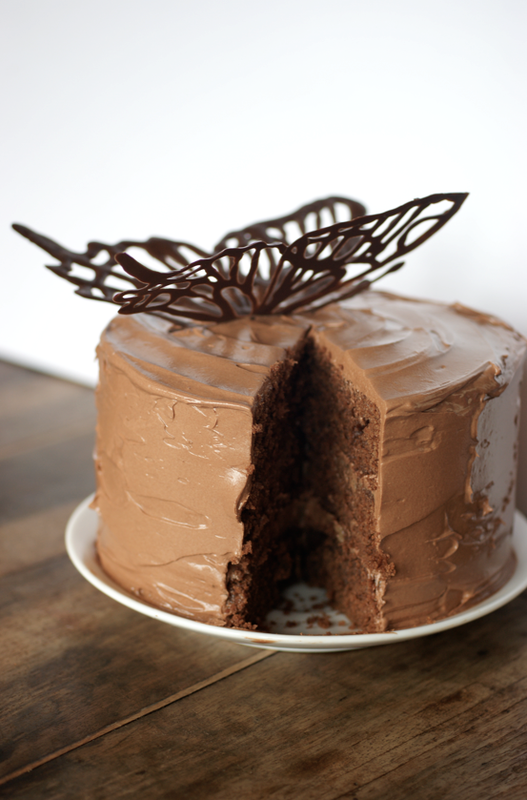 The butterfly is stunning and so is the rest of your beautiful cake creation. I would love to try a piece. What a great accomplishment! Blogging takes dedication, and I'm leaving that with a full time job it's hard to balance and keep time for the things you love!, i.e. I'm jealous! 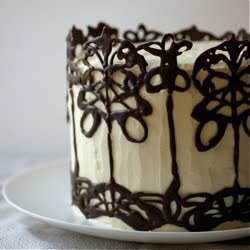 This cake is just beautiful and looks so decadent. What a beautiful blog. Its my first time here and defintely not my last. Just Gorgeous! I think my heart just stopped when I looked at your cake... (in a good way of course!). Emma that cake is beautiful! I am so impressed by your butterfly and you can never go wrong with the Baked book! Congrats on your 100th post! It must feel great! This is a lovely cake -- worthy of any celebration! So glad I found ur site! Great post and pics! Congratulations for your 100th post! I just loved your blog! The recipes and the pictures are amazing! Really stunning picures - I wish I could say I improved that much with mine in hundred posts ... Just filed the recipe under 'favourite recipes', guess it'll make a great birthday cake for my brother. Wow, what a beautiful cake! 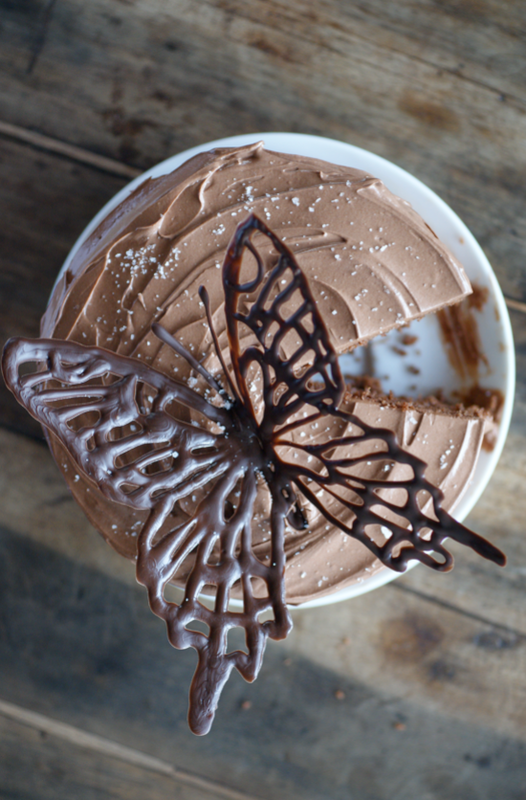 It sounds absolutely delicious to me..salty, caramel, chocolate..a gorgeous butterfly. What's not to love? And congrats on your 100th post too! Just one word in my mind - perfection. And I mean that! Congratulations on 100 posts, that butterfly looks so delicate I wish I could do something like that. Caramel cake sounds wonderful. Congrats on your 100th post. There's a white caramel cake in the new Food & Wine that I've had my eye on. 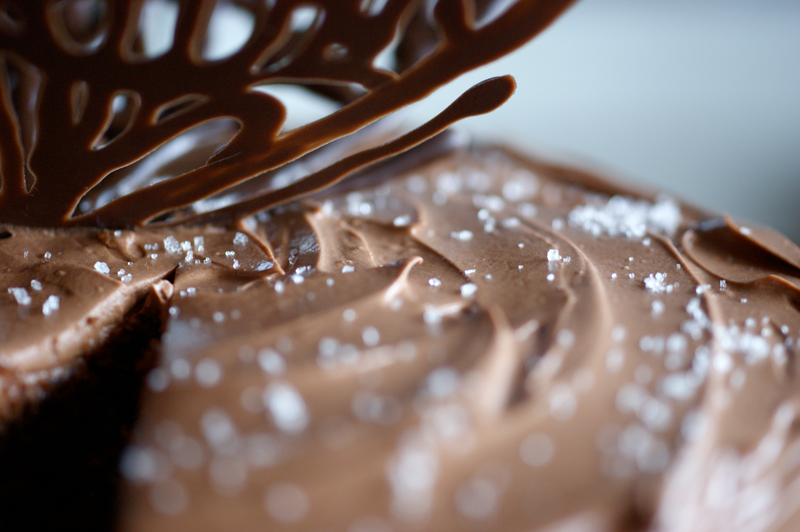 And literally my first thought was to sprinkle salt on the top of the cake--we think alike! This cake is so gorgeous. I wish I could have a slice right now. wow it's wonderful and the butterfly spectacular!!! ciao Lisa! WOW! Beautiful butterfly. You make it sound so easy! I also find that chocolate tends to overwhelm caramel. Usually I just throw up my hands and make a white cake! Congrats on your 100th post :) such an acheivement warrants a fabuloso cake :) well done! This cake looks freakin amazing! Wow! Just discovered your blog via pinterest and can't wait to read more. Am definitely going to give this recipe a try as well as many others over time i am sure. Thank you for the inspiration!! Your photography is lovely too. This was so inspiring! 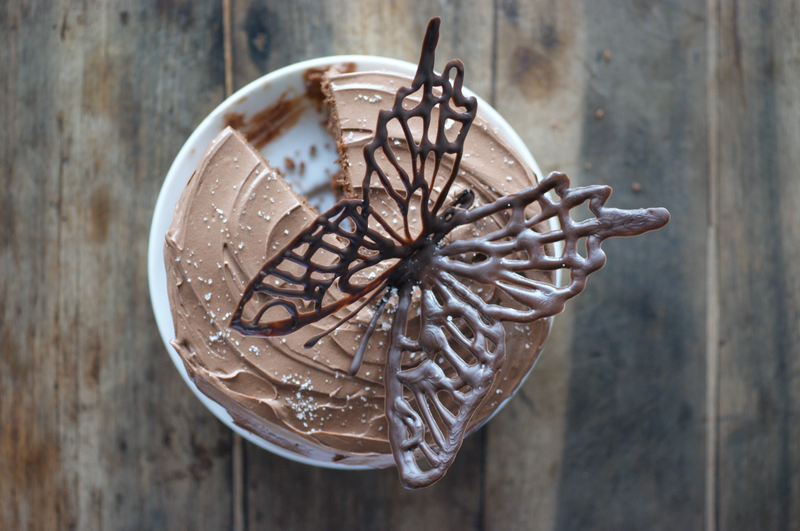 I went straight to the kitchen and tried the butterfly decoration and it was amazing! Much less intricate than yours but such a good idea, thank you for sharing!! I have never made caramel before and I had so much trouble with it. Probably didn't help that is was 1am and I melted my thermometer. If something can go wrong, I'll be the one to find out how bad it can get. I did eventually get it to work and the icing is AMAZING. Thanks for posting! Oh dear I'm sorry to hear about your thermometer! Making caramel is difficult - it gets easier as you get a feel for it. I'm going to write a Foundations post about it soon as it seems to be one of the things people often struggle with. I'm so pleased to hear that it did work in the end, though - well done! This looks AMAZING!!!!!! I love caramel! The butterfly is so intricate!!! I can already taste the delicious mixture in my mind. It looks amazing, I'm so glad you liked it! 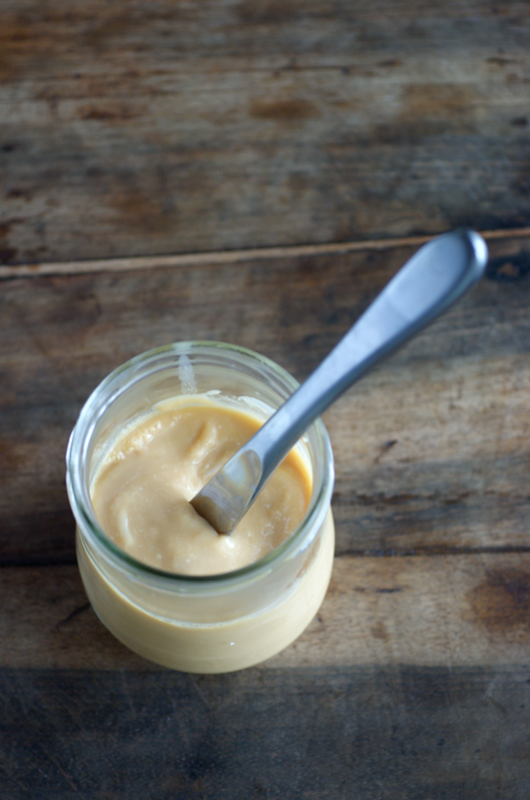 Have you ever substituted golden syrup for the corn syrup? I've read that it has the same properties, where do you stand?